As a veterinary student at Cummings School, Jessica Perry Hekman, V12, VG12, took an extra year to get her M.S. in comparative biomedical sciences so she could conduct research on cortisol levels and stress behaviors in hospitalized dogs. She found that anxiety levels in these pets separated from their owners were even higher than those of dogs during a thunderstorm. Later, while working toward her Ph.D., she studied the stress response in foxes bred to be tame as compared with those genetically programmed for aggression. Today, Hekman is a postdoctoral associate at the Karlsson Lab, a joint endeavor of UMass and the Broad Institute of MIT and Harvard that studies dogs, exploring how genetics affect behavior. We spoke to her about dog anxiety, the influence of genetics, and lessons she has learned from her own dogs that she chronicles on her blog “The Dog Zombie” (“I’m fascinated by dog brains—just like zombies like brains”). Why are you interested in dog anxiety? I’m anxious myself, and it took me a long time to understand how much that changes my perspective and how I interact with people. So I’m familiar with what stress and anxiety feel like and am sympathetic. The system is very similar in all mammals, so when I learn about it in dogs, I’m learning about it in humans to an extent. When we apply for funding with the NIH, we say that dogs make great models for human behavior, which they do, and much of what we find will apply to humans. If you ask me, though, I’m in it for the dogs. You write on “The Dog Zombie” that adopting your dog Jenny has informed your understanding of anxiety. How? Scientifically, it helps me think through how Jenny’s brain works and how shy dogs respond to the environment, and what that means in practice. For example, if there’s a loud noise, everyone jumps, but Jenny stays frightened for another hour. Does that part of her brain that signals the release of cortisol for the fight-or-flight response stay switched on in some way? Is there a mechanism to turn it off? Is it broken? You write that genetics and early experience are critical in shaping the adult personality of dogs. Does one seem to have more sway? Well that’s the classic question, isn’t it? With some dogs, you don’t do a good job socializing them and they’re fine; with others, you try really hard to socialize them, and they’re a mess. They’ve shown in humans there are some versions of some genes that lead to increased risk of anxiety and depression in adults if—and only if—there is childhood trauma. There are much smaller effects that may be triggered by much smaller things that are harder to find. That’s my passion, finding these little changes in the environment that can lead to differences in “normal” personality. You chose your dog Dash from a breeder after doing almost as much research as one might for a sperm donor. Is that more reliable than going with your gut? I wonder sometimes. You can do as much careful research as possible about getting a puppy and then raise them as carefully as possible, and things sometimes still go wrong. Why? By chance some dogs have resilience. Can we find genes that confer resilience, and if we find those genes, how different do those dogs’ brains function? We’d all like to know. Is overbreeding contributing to problems like anxiety? The famous dog researcher Ray Coppinger, who died in August, said to think of it like a child’s mobile: If you pull one end, the rest of it will move. That’s what it’s like to select dogs for a particular characteristic. If you select for a certain coat color and worry about that first, I can’t help but think that’s a problem. We should worry about behavior first. Debatably, we should worry about health first, but behavioral problems kill a lot of dogs. 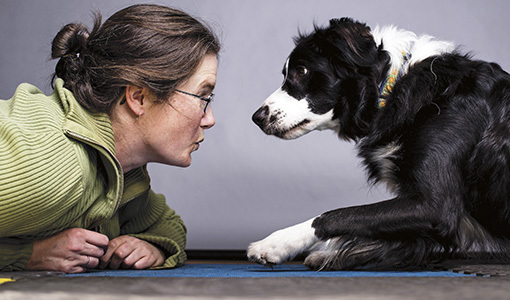 What do people misunderstand most about dog body language? One is people think a wagging tail is always friendly, and it’s not. The other is that people think a dog isn’t going to bite them unless it loudly growls and barks first. A really major one for dogs with anxiety is they roll over to show fear, and people think they want a belly rub—that’s exactly what they don’t want. With shy dogs, it’s a really good rule to let the dog touch you first. If the dog wants to be petted, he’ll probably bump your hand, initiate contact. If he doesn’t want it, he’ll look away from you. What’s the most important consideration in picking out a new dog? My gut is to say it’s energy level. If you can’t handle a border collie’s energy level, and there’s no getting around the fact that you’re a couch potato or you don’t have a good place to let the dog run, then get a Great Pyrenees. People think size is important, but a really big dog can do great in a small apartment. Do breed-specific bans ever make sense? Can genetics predict aggression? No and no. We hope to be able to find variants in genes that would increase the risk of aggression, but it’s a very complex trait and environment is a massive factor that you can’t totally control. Also there’s a lot of bias in reporting breeds of dogs that bite—for example, any sort of blocky-headed dog is called a pitbull—and there’s a lot of underreporting of bites by other types of dogs. Elizabeth Gehrman is a freelance journalist based in Buffalo, New York.